Another dreaded, steep climb: the Mortirolo (or Passo della Foppa) with a summit at 1,852 meters. It used to be the favorite mountain of Marco Pantani. Described here are the three “most famous” alternatives, but there are quite a few ways to the top of the Mortirolo, many of which no more than goat paths and/or hiking trails. I climbed the Mortirolo in 2011 from Mazzo and in 2015 from Monno – reports here (2011) and here (2015). However, this climb is rather constant in its steepness – the last kilometer is a little less intense, so you have the chance to recover a bit and look “fresh” when you take a picture / selfie at the summit. It’s during this climb that you will pass the Pantani monument – it is located in turn 11, about four kilometers from the summit. 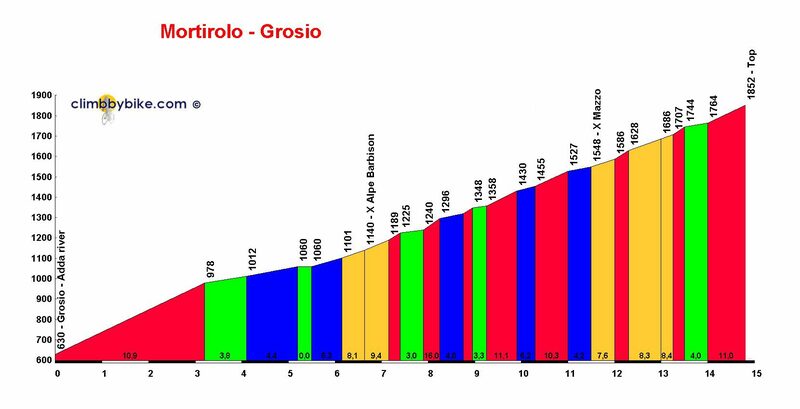 Deemed a slightly easier alternative on the west flank, is the climb from Grosio, which is located just north of Mazzo. This climb is 14.8 kilometers long, with an altimeter gain of 1,222 meters. I’ve seen this end twice as a downhill, never have I climbed it. From what I was able to assess – as far as possible in a descend – this climb seems a lot more irregular, which also corresponds to what you can see on the profile card of CBB. Despite the deceiving 8.3% average, many stretches are possibly even steeper than the ones found in the climb from Mazzo, but there are “easier” parts to recover a bit. From the (south) east you can tackle the Mortirolo from Edolo – this is the road towards the Tonale (Ponte di Legno) and the first couple of kilometers from Edolo until the Monno turn, can be used as a good warm up. From there you need to overcome an 900 meter elevation gain in approximately 11.7 kilometers – relatively speaking, this may be considered easy. Coming up this end, you will pass the only tavern near the summit – about a kilometer before you arrive there, you’ll pass the Albergo. The Colle Fauniera, a.k.a. Colle dei Morti (“Mountain of the Dead”) is part of the Colli di Cuneo, a range of high mountain passes in the Cottian Alps, Piedmont, northern Italy. The rather ominous name Colle dei Morti stems from a fierce battle which occurred in the area during a 17th century clash between Franco-Spanish and Piedmontese troops. Generally speaking, this pass is not very much traveled – it is not that widely known and thus not (overly) popular to motorists, and the state of the road doesn’t attract as much as for instance the Stelvio. However, while it may lack attractive hairpin sections, the views are spectacular and the green meadows, filled with a variety of alp flowers, are home to a large population of marmots. With its summit at 2,481 meters, it also owns a top 10 spot in the list of highest paved passes in Europe. At the summit you will find yet another monument dedicated to the late Marco Pantani, in memory of his epic climb during the Giro of 1999. I’m not sure how many “Pantani Forever” monuments there actually are, but I’ve cycled passed four of them so far: on the Mortirolo, my favorite, on the Galibier, on les Deux Alpes and this one. However, at the time of writing, ratification from the Institute of Military Geography of Italy has not been given yet and it may never come to that either. There are 3 possible routes to climb the pass on a road bike, all of them with an average grade of 7% or more. Starting from Demonte, the ascend is 24.7 km long. Over this distance, the elevation gain is 1,721 meters, which puts the average grade at 7%. Report of my trip here. Starting from Ponte Marmora, the ascend is 22 km long and the elevation gain is 1,567 meters, which means the average grade is 7.1%. And starting from Pradlèves, the ascend is 22.4 km long, with an elevation gain of 1,689 meters, which – at an average grade of 7.5% – makes this the toughest climb, looking at the grades anyway. During the Giro’s of 1999 and 2001, the Fauniera ascend from Pradlèves was included in a stage – in 2001 it was also Cima Coppi.